I wrote the following piece in response to a Toronto Star article by Catherine Porter, "The power of soup, skates and simplicity" on Nov. 21 2009. I thought you might like it as well. It was like déjà vu, looking at the newspaper photo of the outdoor skating rink at Dufferin Grove! I couldn't believe my eyes. Fifty years ago, my girlfriends and I went to skate there after school and on Friday nights. Looking at the photo, I was struck by the fact that nothing had changed in those fifty years. The rink is exactly the same as it was all those years ago. It was as if it were stuck in a time warp. And I was pulled back as if it were just yesterday. 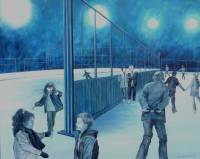 On weekdays, the gates at either end of the boards running down the centre of the ice were closed and the ice was divided into two rinks. On the right was the pleasure rink for anyone in the community to enjoy - young and old, beginners awkwardly trying to stay on their feet and those more experienced spinning and gliding effortlessly. On the left was the larger rink, where the boys played games of pick-up hockey. In those days, there were no organized leagues in sports complexes, no uniforms, no fees, no admission. All the boys needed were skates and hockey sticks, which they had bought for ninety-nine cents. All the girls needed were figure skates they had bought for a few dollars at Woolworth's. Of course, girls did not play hockey then. We just watched the boys out of the corner of our eyes. And the boys knew that we were watching them. The first girl to play years later, was Abby Hoffman, who had masqueraded as a boy for ages before she was found out. There was a huge public outcry and she was in the newspapers for her audacity. On Friday nights, the gates were raised and the ice became a large pleasure rink, with Strauss waltzes blaring over our heads. My girlfriends and I walked to the rink, with our skates slung over our shoulders, no matter how cold it was. We didn't have special winter pants, only brightly coloured cotton chino pants. By the time we got home, our legs were numb and bright red from the cold. 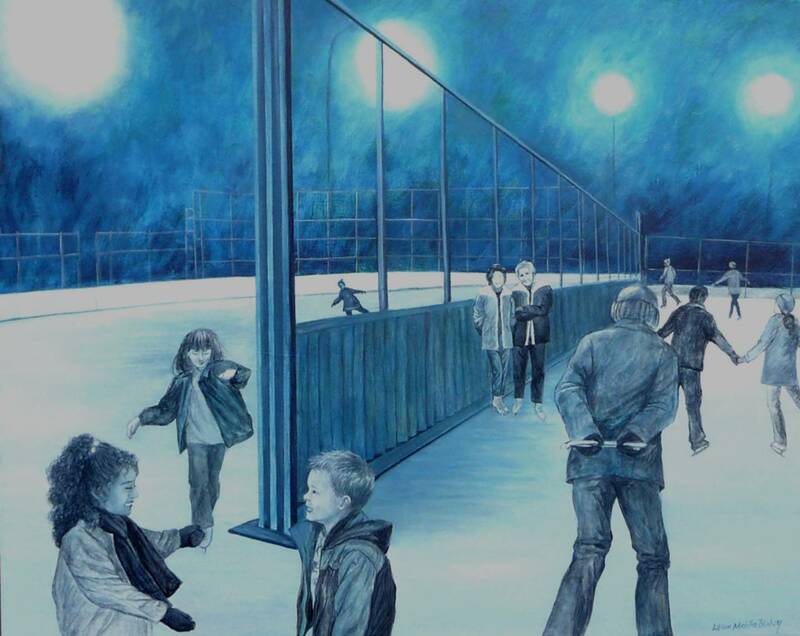 We were always excited as we walked hurriedly to the rink, anticipating chance meetings with boys. No-one knew who would be there and that was part of the lure. We waited in anticipation, and invariably, some brave boys would venture to come over and ask us for a skate around the rink. And for the girls, there was great excitement just in skating in the hockey rink. There were two small change rooms, one for the men and the other for women. I can still smell the wetness of wool and see the pools of slush on the cement floor. The only refreshment was a hot chocolate machine, which dispensed some of the worst watery hot chocolate you can imagine, but we loved that awful drink which warmed our insides and our freezing hands. I can still smell that hot chocolate. And so, I just wanted to tell you my little story, because today, everything is so organized in the lives of children, that they have little opportunity for freedom to grow up the way I did. I am so happy to see that this little corner of my childhood is exactly the way I left it. At least a few children will have the chance to be free to enjoy my world from once upon a time.